How To Do A Really Good Job Washing Your Hands : Goats and Soda A recent study gives thumbs up to the World Health Organization's 6-step plan. The problem is that lots of people — including health workers — fail to scrub. Yes, soap is good. It helps dislodge those microbes. But some experts say: Wet your hands first, then add soap. It's a problem for health workers as well. The Centers for Disease Control estimates that medical staff only remember to do so about half the times they're supposed to. The CDC states: "This contributes to the spread of healthcare-associated infections that affect 1 in 25 hospital patients on any given day." Worldwide, one in 10 patients acquires an infection while receiving health care. CDC offers straightforward instructions: soap up, scrub and rinse. The process should take 35 seconds — about the time it takes to sing the alphabet song twice. The World Health Organization has its own instructions. The process takes a tiny bit longer – 42.5 seconds. And there are six very specific steps. 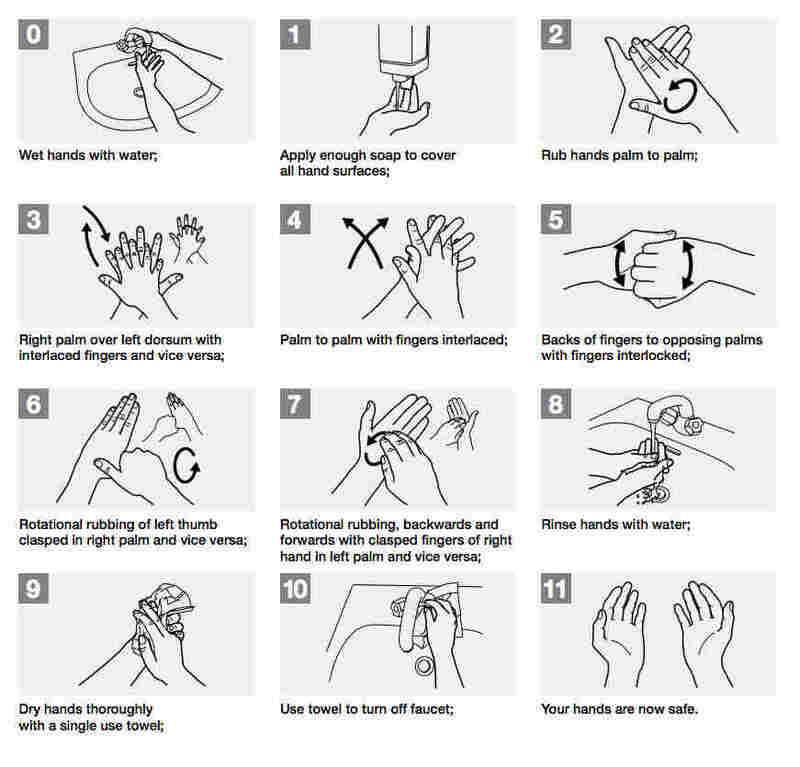 WHO's technique is a deliberate process to get rid of germs in all the nooks and crannies of the hands. First, rub your palms against each other, then rub the back of each hand against your palms. Rub your palms together with your fingers interlaced, rub your palms against each other while your fingers are interlocked, rub your fingers around each of your thumbs, and finally, rub each palm with the tips your fingers. Both the CDC and WHO methods, which have been around for decades, are also taught at elementary schools (to germy kiddos) and restaurants (to staff who handle your food). Recently, researchers wanted to compare them to see which was the best way to minimize bacteria. In a small study recently published in the journal Infection Control and Hospital Epidemiology, researchers at the Glasgow Caledonian University in Scotland watched carefully as 42 doctors and 78 nurses cleaned their hands using either the CDC or WHO routine. They found that the WHO technique reduced the average bacterial count on the medical workers' hands slightly more than the CDC's method. In any case, both organizations' work really, really well, says study author says Jacqui Reilly, a professor of infection prevention and control at Scotland's Glasgow Caledonian University who led the study. The real issue is that health care workers aren't cleaning their hands as often and as thoroughly as they should — basically every time they touch their faces or touch anything that isn't sterile. And when it comes to doing a good job, even having a set of directions doesn't guarantee good results. In Reilly's study, only 65 percent of the 120 participants completed the two techniques properly, despite having instructions right in front of them. Reilly herself says she's been using the six-step method since she was first taught it at medical school. "I don't think about it consciously anymore," she says. She highly recommends you try it out after using the toilet. And if you don't, at the very least, she says, remember that "any time you wash your hands, it should take at least 15 seconds." And avoid the making the rookie mistake of rubbing soap onto dry hands and then rinsing it off. If you wet your hands, first, Reilly says, the water works to dislodge any microorganisms clinging onto your skin, so that the soap can scrub them off: "So always wet your hands first."